Yes folks, it's another 'new to me' challenge today! I hope you are all having a lovely Sunday! The sun is actually shining here in the wet SW and there isn't a cloud in the sky . 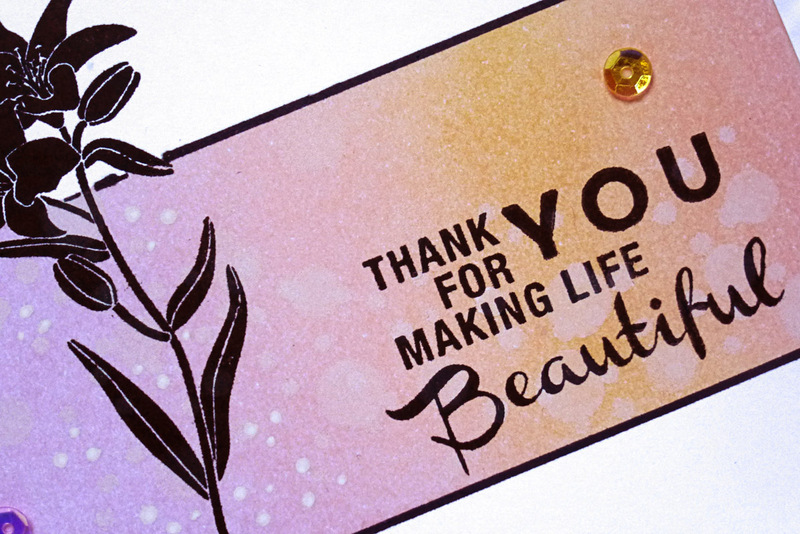 . . which leads me neatly into the challenge One-Layer Simplicity Challenge - Gratitude and the sentiment on this card! I will list supplies used below. First I masked off the strip across the bottom third of the card and sponged some distress inks very gently, as I wanted a soft look for this card. Next, I stamped the Lily silhouette from Hero Arts 'With Sympathy' stamp set and the greeting from Avery Elle's 'Love Notes' stamp set and sponged some white pigment ink through a home made stencil for a soft bokeh effect and added a few white dots with a gel pen. And thank you my friend for sharing this beauty with us. Simply beautiful and you totally rocked the one layer card! A gorgeous one-layer card...what wonderful use of white space and the sequins are such a lovely touch! Thanks for playing the OLS Challenge! Hope you'll come back again and again! What a wonderful one layer card, my friend! Love those soft colors! You achieved lots of dimension on your beautiful OLC! You are really on a roll with all these new challenges, my friend!!!! 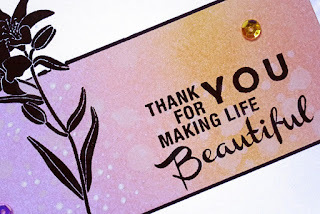 You have made a stunning OL!!!! I love the soft colours and the bokeh effect is absolutely lovely!!!! 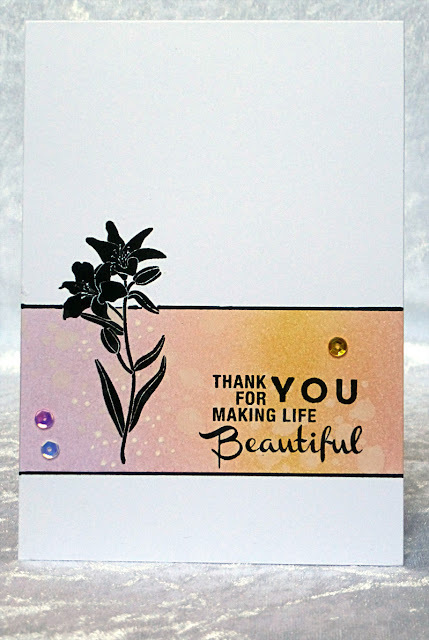 That lily stamp is so perfect and pretty to use with the sentiment and the sponged strip!!!! This is really such a FABULOUS creation, Hazel!!! For sure a winner!!! Have a wonderful evening, dear Hazel!!! I love the color you have created on this strip. It give your strip so much interest. 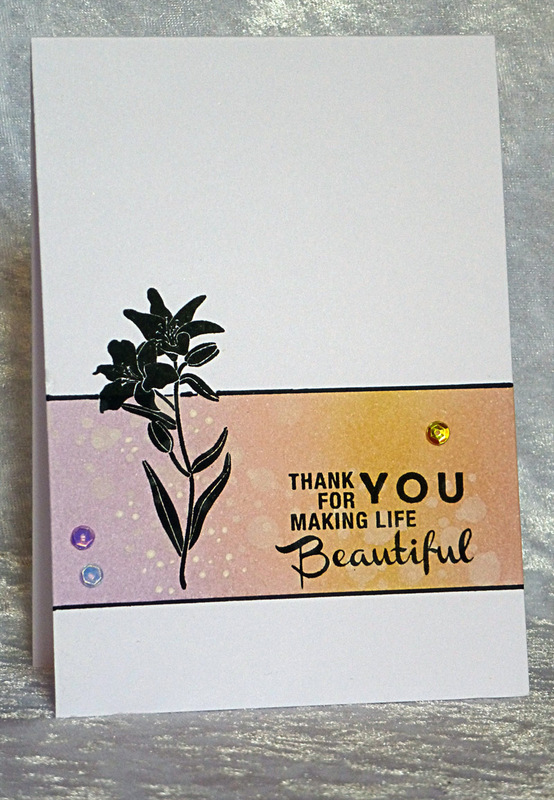 Then the black flower just makes your card POP! Jugs is having a one layer card challenge. You should check it out!